Legislation to increase the fuel tax for airlines at Newark Liberty International Airport moved one step closer to the Governor’s desk today when it received Assembly Appropriations Committee approval. The bill, A-4392/S-2892, would expand the state’s taxes on aviation fuel requiring all commercial airline carriers to pay 4 cents per gallon on all fuel purchased in New Jersey. Currently, the state collects taxes on fuel used during taxiing and takeoff, but not during flight. The tax revenue must be used for airport-related improvements. NJBIA Vice President Andrew Musick opposed the bill because if its impact on the cost of doing business. Under New Jersey’s Petroleum Products Gross Receipts Tax (PPGRT), all air carriers that operate in New Jersey are subject to tax based on only the aviation fuel used during the burnout period. However, this legislation would subject all aviation fuel sales, other than those at airports in the State with fewer than 20,000 scheduled commercial passenger flights per year, to the full 4 cents per gallon rate. This would increase costs on nearly all commercial air carriers in New Jersey. Such a move would have a big impact on New Jersey’s economy. United Airlines and its regional partner carriers operate more than 400 daily flights out of its Newark hub and serve 14.6 million passengers a year. Legislation to increase the fuel tax for airlines at NewarkLiberty International Airport moved one step closer to the Governor’s desktoday when it received Assembly Appropriations Committee approval. The bill, A-4392/S-2892, would expand the state’s taxes on aviation fuel requiring all commercial airline carriers to pay 4 cents per gallon on all fuel purchased in New Jersey. Federal rules allow the state to collect taxes on fuel used during taxiing and takeoff, but not during flight. 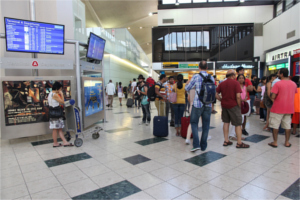 The tax revenue must be used for airport-related improvements. Under New Jersey’s Petroleum Products Gross Receipts Tax (PPGRT), all air carriers that operate in New Jersey are subject to tax based on only the aviation fuel used during the burnout portion. However, this legislation would subject all aviation fuel sales, other than those at airports in the State with fewer than 20,000 scheduled commercial passenger flights per year, to the full 4 cents per gallon rate. This would increase costs on nearly all commercial air carriers in New Jersey.